New York — With roughly 37,000 MW of installed hydro power capacity, Quebec has ample spare capacity that it would like to deliver into Northeastern US markets where ambitious clean energy goals have been announced, but expanding transmission infrastructure is challenging. New York recently announced a goal of receiving 100% carbon-free energy by 2040 and the New England states all have ambitious greenhouse gas reduction goals, including a Massachusetts law requiring GHG emissions be 80% below 1990 levels by 2050. 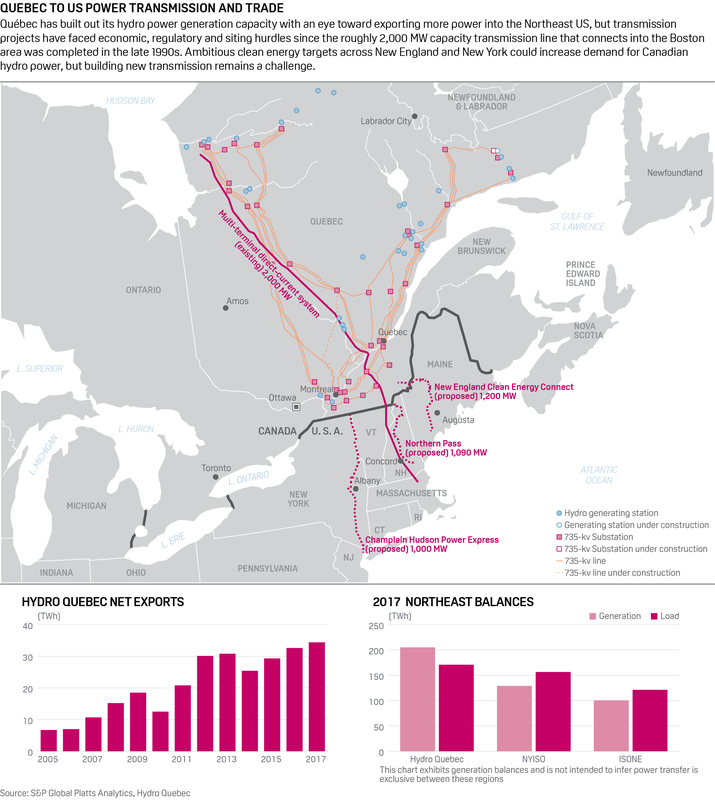 "It's interesting to recall that in the 1980s, two decade-long contracts paved the way for construction of Phase II of the multi-terminal direct-current system (MTDCS), a cross-border line that delivers up to 2,000 MW from northern Quebec to New England," Hydro Quebec spokeswoman Lynn St-Laurent said in an email. In March 2017 an HQ proposal was selected by Massachusetts regulators to supply 9.45 TWh of firm energy to be delivered for 20 years. HQ's proposal consisted of hydro power supply and possible transmission scenarios developed in conjunction with US partners. The New Hampshire Site Evaluation Committee in March 2018 voted unanimously to deny approval of the $1.6 billion Northern Pass Transmission project, which is a joint venture between HQ and Eversource Energy's transmission business. Eversource has been fighting the decision, with the New Hampshire Supreme Court accepting the company's appeal of the NHSEC decision in October. NECEC is a joint venture between HQ and Central Maine Power, which is a subsidiary of Avangrid, a company affiliated with Spain's Iberdrola. The NECEC project has received opposition from some environmental groups and still needs several state and federal permits. "The 5% of New York's load that we furnish year in and year out ... is mostly going into the north of the state, it's not coming down here," Sutherland said during a discussion at Pace University in New York City in 2017. Under New York's proposed Climate Leadership Act which calls for the 100% carbon-free energy goal, renewable generation eligibility would be determined by the Public Service Commission. The PSC did not respond to a question about whether hydro power from Quebec is being considered as a potential option for meeting the state's clean energy goal. TDI and Blackstone did not respond to requests for comment.